Leonie’s husband Michael is getting out of jail and she thinks it would be a great idea to meet him with their kids Jojo and Kayla, along with her fellow bartender (and drug addict) Misty. Her kids are being pretty much raised by Leonie’s parents Mam and Pop. Her in-laws won’t have anything to do with her, being that Big Joseph is, well, white and racist. Leonie’s story alternates with Jojo, a 13-year-old kid who is very protective of his little sister and has been insulated from the worst of Leonie’s life by his grandparents. The third voice in the story is Richie, a ghost from Pop’s past that is unable to leave the Earth. And there’s another ghost too – Leonie is having visions of her dead brother River, killed by her husband’s cousin. 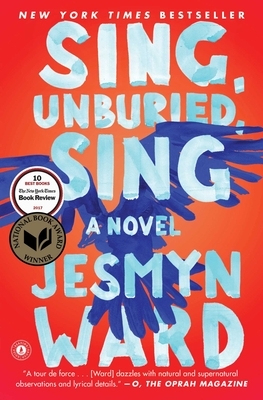 Everything they say about Sing, Unburied, Sing is true. The writing is just beautiful and it’s no coincidence that Bois Sauvage, the setting, is Ward’s Yoknapatawpha – Ward’s third novel is truly William Faulkner meets Toni Morrison.